Links command line interface based browser with Graphics can only be enabled on OS X with make function. During the build process, one need to enable graphics. We wrote about Command Line Web Browsing in previous article with all the softwares we found are in usage. We mentioned in that article, that Graphical features of Links command line interface based browser demands manual installation and we will create the full guide as a separate article. Here is the article. Links is possibly one of the best CLI browser, the development part is great but the maintenance part is not modernized. We found nothing on SourceForge, GitHub. We will upload a version for easy working and development by the community. May be, many are not aware that Links exists. The name is also very pathetic to search with being too much general terminology. Obviously, you will be downloading the latest version. Not understood ? Run ./configure –help to see what options it lets you set. All over the web you will see the wrong copy pasted command. Previously, the location was /usr/include/X11 ; they forget to check that does not work. Google hugely loves these kind of copy pasted websites. Users will complain, fight, but can never solve it. This Article Has Been Shared 4837 Times! 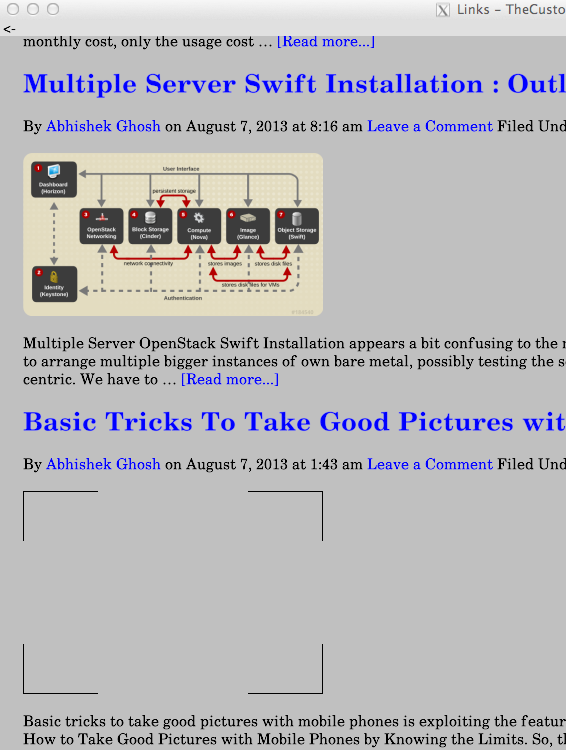 Cite this article as: Abhishek Ghosh, "Links CLI Based Browser With Graphics : OS X Build," in The Customize Windows, August 7, 2013, April 25, 2019, https://thecustomizewindows.com/2013/08/links-cli-based-browser-with-graphics-os-x-build/.